The Corinthian strikers are asking for debt justice, not forgiveness. On Monday, the Department of Education made a grand gesture of forgiveness, offering relief to the former students of the scandalized for-profit college chain Corinthian. The notorious franchise—widely condemned as a predatory diploma mill that bilked both the government and hundreds of thousands of students—recently filed for bankruptcy, amidst charges of massive fraud. As public outcry mounts, Education Secretary Arne Duncan announced that the administration would create a “durable” process for fraud victims to apply for federal loan relief. The key word was “possible.” To embattled anti-debt activists, the measure smacked of political trickery by the federal authorities that had long failed to regulate for-profit schools like Corinthian. The Debt Collective, an Occupy-inspired campaign against the student-debt system, seeks immediate relief for all Corinthian students. The process of requiring students to file individual claims, they argue, merely deflects public attention from the Corinthian’s crimes and the $1.2 trillion education-debt crisis that the company symbolizes. Duncan’s plan claims to offer a streamlined process for dealing with borrowers’ petitions for relief, but it falls well short of the total discharge of debt that activists have been seeking—and have instructively outlined for Duncan in a model draft order. The Department of Education is also making special provisions to provide loan forgiveness to former students of one Corinthian branch, Heald College, which recently got slapped with $30 million in fines over false marketing of job placement rates. Ordinarily, student borrowers can qualify for loan relief if their school shuts down during or shortly after their enrollment. Now the Department of Education is allowing individual petitions for relief under an obscure law known as Defense to Repayment. The debt strikers argue that the complex legal process for Defense to Repayment is unnecessary, since Corinthian’s financial implosion has left its schools basically defunct and the evidence of fraud is glaringly clear. Meanwhile, many debtors spiral deeper financial desperation, unable to secure steady employment with their essentially worthless degrees. The Debt Collective—which has organized more than 1200 people nationwide to join in solidarity with the Corinthian strikers’ campaign against debt repayment—argues that a case-by-case approach will push borrowers into a byzantine legal process, with no guarantee that they’ll be made whole. The debt strikers should know, having already initiated more than 1,400 petitions to cancel their individual debts. Although the activists are working with a team of organizers and legal experts, they report major difficulties in gathering the necessary documentation and other legal evidence. Suggs says she wrote her attorney general for help with her petition, and was advised to get a lawyer. Now countless other students—many of them poorer, with even more limited access to legal advice—may face even steeper barriers as the administration forces them into a bureaucratic rigmarole. With roughly 350,000 Corinthian students from the past five years (carrying an estimated debt of up to $3.5 billion) potentially seeking relief, activists suspect federal authorities are simply trying to deter the debtors, which would leave them without relief and the government relieved of its responsibility. Meanwhile, several federal lawmakers and attorneys general of California, New York and other states have investigated Corinthians scams and pressed the Department of Education to provide some sort of blanket amnesty on former students’ loans. Automatic, class-wide discharges are not only just, they would also serve as a corrective for the Department’s flagrant failures to allocate public funds wisely. [It] would not cost taxpayers, as it would be offset by government profits on the student loan program. 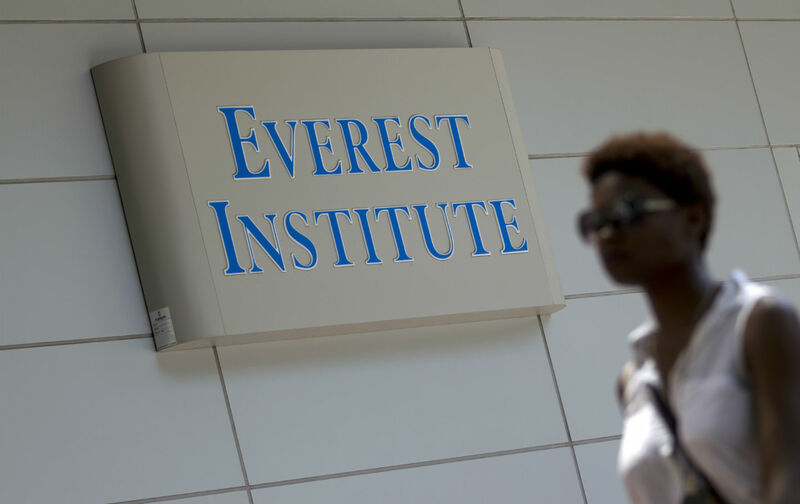 The Debt Collective is targeting Corinthian as a singularly shameful example of the for-profit college industry, which is known to prey on low-income students, single parents and veterans. But their campaign is also calling for a complete abolition of all private and federal student debt. Ultimately the group envisions a structural shift away from a hierarchical, commercially driven business model of higher education and toward free education for all.